Consider making a diaper cake with these easy directions. 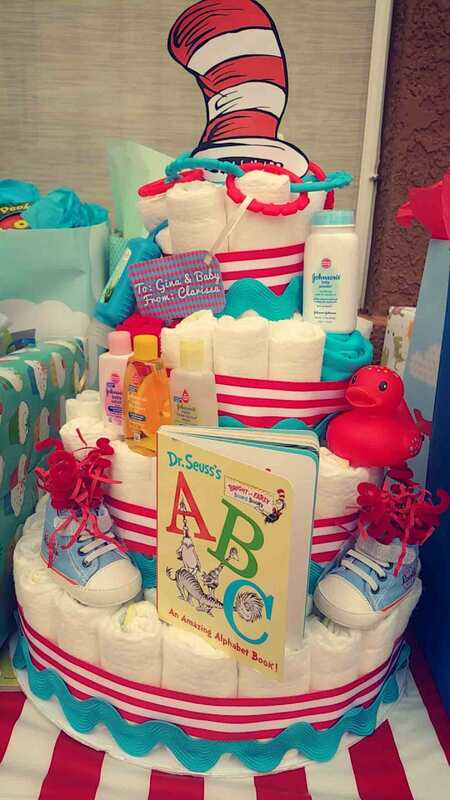 The best thing about a Dr. Seuss diaper cake or any other cake made out of nappies is that not only is it a unique ​baby shower decoration and gift, but it can also double as an interactive baby shower game. To decorate your diaper cake, use ribbon or even pieces of fabric, a hot glue gun and safety pins. Gather small items you might use for a baby such as a bottle of travel size baby shampoo, a bib, a pacifier, a baby spoon, and a nose aspirator. The first step to construct your diaper cake is to roll the diapers. Lay the diaper, front side up, on your work surface. Start at the top edge of the diaper and roll the diaper tightly towards the folded edge. Once the diaper is rolled tightly, wrap a rubber band around it or tie it tightly with a piece of twine. Make sure the rubber band/twine is in the center of the diaper. How Many Diapers Do You Need for a Diaper Cake? Use the technique in step three to roll several diapers. The number of diapers you need depends on how large you want your diaper cake to be. You can either roll several dozen diapers to start with or keep the diapers and rubber bands/twine handy. Set your platter or plate in front of you. Grab seven diapers, a larger rubber band, or a piece of twine. Hold the seven diapers together and stretch the rubber band around them all (or tie them together with twine). Set this grouping of diapers in the center of your plate and get ready to add more. Add more diapers to the base of your diaper cake. One at a time, slip a new diaper into the rubber band that is holding your original seven diapers together. If you do not have a rubber band that is big enough or if you are using twine, carefully set the diapers in place around your original grouping. Use as many pieces of twine, wrapped around the entire grouping, as needed to hold the diapers in place. Continue adding more diapers around the base of your diaper cake until it fills the plate. Tuck in extra diapers or remove extra diapers until your base has a nice round shape. Make sure all of the rubber bands/twine are wrapped around the center of the diapers so they will be hidden by the ribbon. Start out the second layer of the cake the same way you started the first level. Hold together seven diapers and stretch a rubber band/twine around them all. Continue adding diapers until your second layer is about one diaper roll in width smaller than your diaper cake base. The top of my diaper cake was made with seven diapers in the same way that you constructed the base. Set this grouping of diapers on top of the diaper cake and your basic diaper cake is done. The best part of making a diaper cake is decorating it! Make one for a baby shower or a young kid's birthday party. Irrespective of the colors and theme, you need a ribbon that is at least two inches wide, a hot glue gun, and safety pins. Wrap pieces of ribbon around each layer of the diaper cake. This will not only add a splash of color to the cake, it will also cover all of the rubber bands/twine.